You have never heard; you have never known; For a long time your ears have not been open. For I knew that you were very treacherous, and were known as a rebel from birth. He is merciful for his reputation, patient for the sake of his name, slow to anger for his purposes! Mercy means not getting what I deserve. So if the wages of sin is death and I am a sinner then I deserve death. 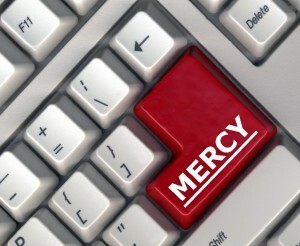 (Rom 6:23) But because God is Mercy in his very essence I am given the opportunity to choose life! God’s very self, his existence, if you will, is at stake! He is Mercy like he is Love. He could not be God if he had less mercy! His mercy desires for ALL men to be saved! (2Pe 3:9) And he waits, he is long suffering, he is slow to implement his wrath, all for his glory! Awesome, amazing, astounding! That I GET to benefit from his reputation!!!!!! Thank you Jesus!